If you grew up or still live on any of the outer colonies, you'll probably recognize this iconic Reactor Module. 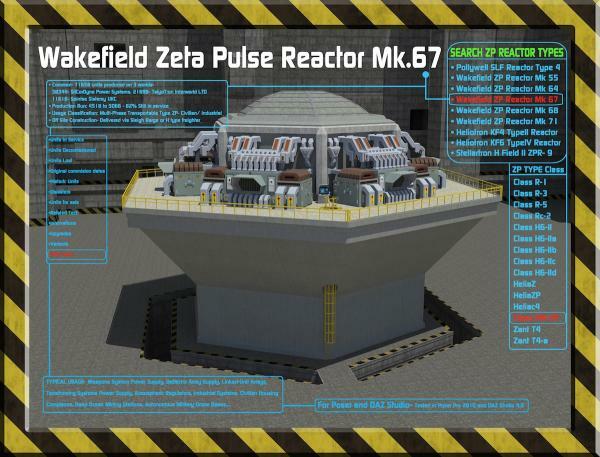 The Wakefield Zeta Pulse Reactor Mk.67. The most common of the SilCorDyne Power Systems, Mark 60 Series. With 71,658 units produced under 3 separate licenses, these Zeta Pulse reactors were produced for off-world use during the Cerilleon Wars. Simple in design, robust in construction they provided energy to weapons systems, defense shields, military bases and remote outposts during much of the war and beyond. After the war they were removed from military service in favor of the bigger, but less adaptable Mk 70 and 80 series (although the 80 series are not true ZP reactors). Almost all decommissioned military units were sold to civilian ventures. Easily transportable by Sleigh Barges, LRIS Tugs or even H Type Freighters (using modified haulage cradles) these reactors could be disconnected from a power grid and relocated across the galaxy as easy as any other large bulk freight units. The modular design allowed these reactors to be used in tandem with unlimited numbers of similar units. Any facility could just keep adding units as its power demands grew. Designed for quick production as part of the war effort, it is amazing that so many survived. A credit to the simple and strong construction. After almost 240 years as many 82% of the units are still in service, providing power to hundreds of colonies, outposts and research facilities today. Tested in Poser 2010 Pro, and DAZ Studio 4.6. Works in DAZ Studio, but some materials such as the metals in the control units will need to be replaced with DAZ Shaders, but otherwise the model will work and look mostly the same in DAZ Studio as in Poser. McGheenie (5 years ago) Inappropriate? Awesome prop thanks for sharing! You are all very welcome!... Sorry JBJDesigns, no easter eggs in this one... well, I did not mention in the promo that there are usable hallways within the walls... but that does'nt really count as an easter egg. Carrie58 (6 years ago) Inappropriate? Very nice as always thank you very much!! Thalek (6 years ago) Inappropriate? Marvelous poster, and the reactor's pretty good, too. [grin] Love it, and thank you! May I have permission to post the poster on my FaceBook page? Stunning work! You are so gifted! Thank you so much for this wonderful piece of art! SteveM17 (6 years ago) Inappropriate? I'm sure I'll get plenty of use out of this. Thank you and well done! Thank you very much, this looks really awesome! Chusha (6 years ago) Inappropriate? This looks fantastic! Thank you for sharing this with us!